Today I am here with a good friend of mine, Tallis Gomes. Tallis a blue belt training at my old academy in Sao Paulo with Fabio Gurgel. Tallis was chosen by MIT, one of the best colleges in the world, as the most innovative entrepreneur in the world. Some of the people who received this reward before him are guys like Mark Zuckerberg and other incredible entrepreneurs. Tallis was also on the Forbes 30 under 30 list and he was responsible for building one of the most successful apps in the world. Tallis has become one of my good friends and mentors. For many of you who don’t know, I am big into the business world. I actually went to college for business and I have some online businesses that you may have heard of like BJJ Fanatics or BJJ Super Deals. Something I always did in my bjj career was seek out the best of the best and train with them. In my hometown of Juiz De Fora I was training under Ricardo Marques who I got all my belts from. He always told me that if I wanted to be the best at black belt I would have to move and be surrounded by the best. This is what led me to moving to Sao Paulo and training with Fabio Gurgel. I was able to train with guys like Bruno Malfacine, Michael Langhi and many other guys who are black belt world champions. I was seeking out the best and people who had either achieved the goals I wanted to or people that had the same goals. This was always an important element to my success on the mats. Find the best people and find like-minded people. This is also why I went to Marcelo Garcia and trained with him, he was the best. For me, Tallis is one of the best in the world in business. He is one of my good friend’s and mentors and he has showed me so much. 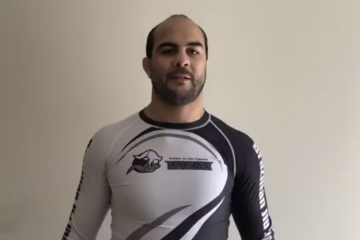 I asked him to make a video explaining the similarities between Jiu Jitsu and business and being an entrepreneur. The video is below, and I think you guys are really going to like it. Many people fail to see the similarities between BJJ and business or life. Tallis does a good job explaining them and I hope you guys enjoy. I know it’s a little different, but he is a genius! Oss!